The club was formed in 1958 when a small group of civil servants sought and discovered a working gravel pit that was suitable for sailing dinghies. Littleton lake in Shepperton owned by Thames Ballast and occupied by “Twicks” (Twickenham Piscatorial Society) was identified, rent was paid, friends made, and Littleton Sailing Club was founded. Cut in two by only the third motorway in the country, the M3, 150,000 tons of rubble from Hook underpass, good relationships with local contractors “Genet’s”, and three club houses later. 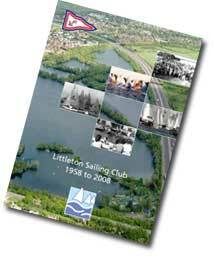 Littleton Sailing Club has a healthy local membership, is a Royal Yachting Association training centre, has several racing dinghy fleets for hire, including children’s dinghies to members and a full race training programme. We share our facilities with Phabsail (Physically Handicapped & Able Bodied Sailors), the Civil Service Angling Club, many BSAC / PADI sub Aqua clubs, a model boat club and local artists who enjoy the light spacious club house. Surrey Search and Rescue also use the lake for training exercises from time to time.